"Amore" means love and your guests will certainly LOVE this event favor! Uncork the fun with this stainless steel multipurpose key ring bar tool from the "Amore" Collection. 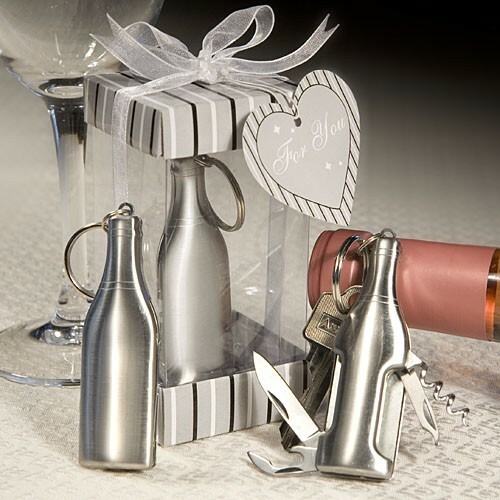 Shaped like a wine bottle, each 3" x 1" x 1/2" tool/keyring combo includes a set of 4 retractable blades - knife, opener/screwdriver, file and corkscrew tucked inside. Combining practicality with fun, it's attractively packaged in a clear plastic display box with a silver, black and white striped top and base.